When it comes to associations and association professionals, this interview in the Wall Street Journal offers some good information. The 47-year-old knows networks. Reid Hoffman built his reputation by founding the business social-networking platform LinkedIn and serving as chief operating officer of the e-commerce site PayPal, both billion-dollar powerhouses. He was an early investor in YouTube, Yelp, Flickr, Zynga ZNGA and, oh yes, Facebook. He has a theory on what makes ventures work: understanding that information is no longer isolated but instantly connected to everything else. Call it the move from the information age to the network age. It's not just online, on Facebook and Twitter, but everywhere. It is the sum of those communications, conversations and interactions. "Your identity is now constituted by the network," he says. "You are your friends, you are your tribe, you are your interactions with your colleagues, your customers, even your competitors. All those things come to form what your reputation is." In short, you are no longer the only one in control of your résumé. But more than ever, he says, he was convinced that an interconnected age was coming and would be driven by the proposition: "How do we lead better lives in the 'real world' with the electronic world as kind of an overlay?" Mr. Hoffman talks of a new contract, an alliance. 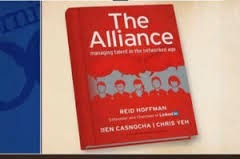 "Alliance," not coincidently, is the title of his latest book. "For individuals, it's trading lifetime employment for lifetime employability. The company should invest in you to keep you employable," by always offering more training and expanding responsibility, even if you never leave. Employees, in exchange, "will work to keep the company adapting and valuable and growing over the long term." Adaptive employees keep companies vibrant, but those same employees are much more likely to stay if they know they'll get to keep adapting, gaining responsibilities and expertise. The new reliance on how information travels in networks will create many winners, but also losers, namely those companies that can't or won't keep up. "It's how everything operates: communications, employment, transactions, finances. In 20 years, if you're not operating your strategy in these domains, with deep understanding that we are living and working in a networked age, then at that point, you're the Dodo bird." Read this interview from the perspective of an association professional seeking to build a long-term career in association management and/or nonprofit management. Read this interview from the perspective of an association executive seeking to create an environment that attracts talented professionals to join and remain with your organization.